Even though Christmas is just one day, the run-up to the festive finale lasts for weeks. Then, just when you think you can breathe a sigh of relief (the turkey’s finally finished – phew! ), along comes New Year’s Eve and the party starts again! 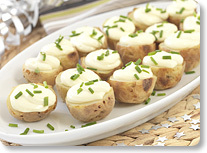 Pre-heat the oven to 200°C/400°F/Gas mark 6 and bake your potatoes for 35 minutes, or until they’re soft. Allow 5-10 minutes to cool and then swirl a portion of Primula Light Cheese Spread on the top of each half and sprinkle a pinch of chopped chives to serve. 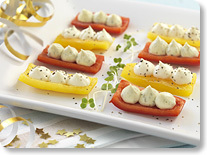 Cut your peppers into quarters and squirt generous swirls of Primula Light Cheese Spread along the centre of the pepper batons. Arrange on a serving plate and sprinkle with a little cress and cracked black pepper. 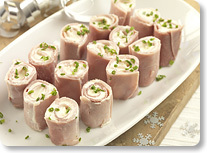 Pipe the Primula Light Cheese Spread over the surface of the ham and roll the ham and cheese up to make a long sausage. Place into a freezer-proof container and pop into the freezer for 20 minutes to firm up. Gently chop into even-sized wheels and arrange on a serving plate and sprinkle with chives. 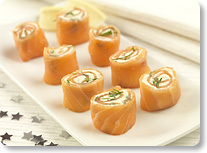 Pipe the Primula Light Cheese Spread over the surface of the smoked salmon and roll the smoked salmon and cheese up to make a long sausage. Place into a freezer-proof container and pop into the freezer for 20 minutes to firm up. Gently chop into even-sized wheels and arrange on a serving plate and sprinkle with dill. Cut off the very top part of each tomato and scoop out the seeds. Squeeze a dollop of Primula Light Cheese Spread into each tomato shell and arrange them on a serving plate and sprinkle on some cracked black pepper. 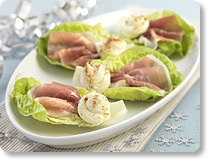 Place the gem lettuce onto a serving dish and gather the Parma ham into a fan shape and arrange on each leaf. Pipe a big swirl of Primula Light Cheese Spread at the base of the ham and sprinkle a pinch of paprika over the cheese.